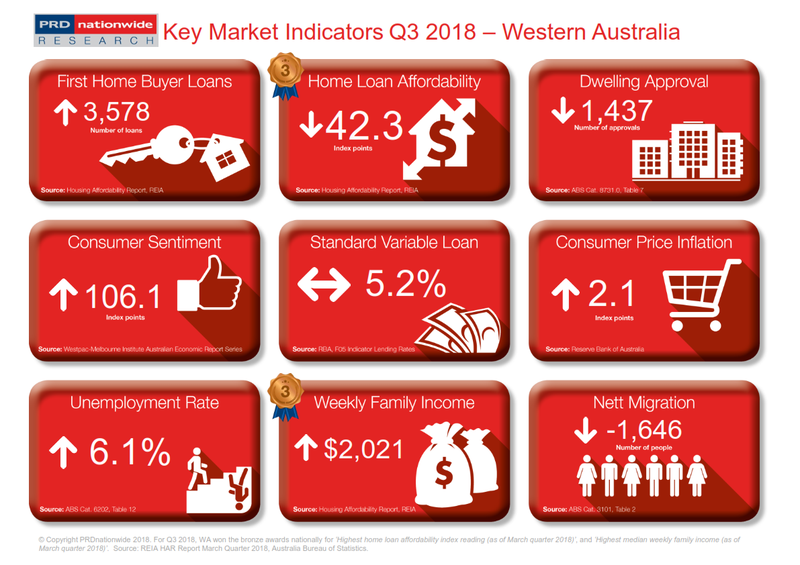 Western Australia (WA) continues to earn the bronze award nationally for both highest home loan affordability index reading and highest median weekly family income categories in Q3 2018 Key Market Data Indicators, where they took out the same awards nationally in the Q2 2018 Key Market Data Indicator. As of March 2018, WA’s home loan affordability index reading was 42.3 index points, well above the Australian average of 31.9 index points. That said this is a slight decline when compared to December quarter 2017 – WA recorded a home loan affordability index reading of 42.8 points at the time. This is potentially explained by the mild increase in WA’s property prices, particularly the 3.9% growth seen in the regional areas over the past 12 months to the 1st half of 2018; as quoted in the PRDnationwide Australia Economic and Property Report 2018. That said there is good news. WA earnt the bronze award nationally in the highest median weekly family income category, with the median weekly family income increasing from $2,014 in December quarter 2017 to $2,021 in March quarter 2018. This has allowed for a small 0.5% increase in the number of first home buyer loans over the past 12 months to March 2018, recording 3,578 loans. Furthermore, dwelling approvals has declined by -12.0% over the past 12 months to June 2018, recording 1,437 approvals. This strategy matches the decline in nett migration into WA, which will create a more balanced demand and supply market. This will further contribute to the already affordable market, proving WA is the place for unique affordable options.